MENLO PARK, Calif. -- A three-month-old kitten that was found discarded in a gas station dumpster last month in Menlo Park was adopted Monday afternoon, a spokeswoman for the Burlingame-based Peninsula Humane Society & Society for the Prevention of Cruelty to Animals said. 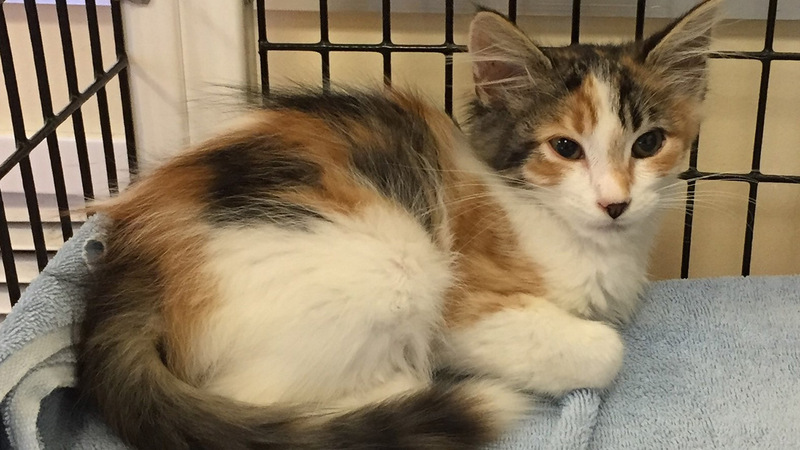 The kitten named Prudence was adopted at about 4:30 p.m. Monday by a couple from San Mateo. "We're super happy about that," spokeswoman Buffy Martin Tarbox said. The couple also adopted a kitten named Matilda. Prudence was found scared, dirty and hungry on Aug. 24 in a dumpster at Willow Cove Gas at 500 Willow Road. "We responded to a call from concerned workers at a gas station in Menlo Park who said they heard a kitten crying from inside the dumpster," Tarbox said in a statement. "Because of the height and slippery sides of the dumpster, it's highly unlikely she climbed inside herself." Israel Rivas, who works at the gas station, said he saw the kitten two to three days before she was rescued. On the day he saw her she was not in the dumpster and he tried to coax her into a box to rescue her. But Rivas said he was unsuccessful, adding that Prudence was very scared when he tried to rescue her and would not come to him. Tarbox said Prudence had no microchip or collar. After the state-mandated waiting period for someone to claim her, humane society officials had her spayed, vaccinated and placed for adoption.